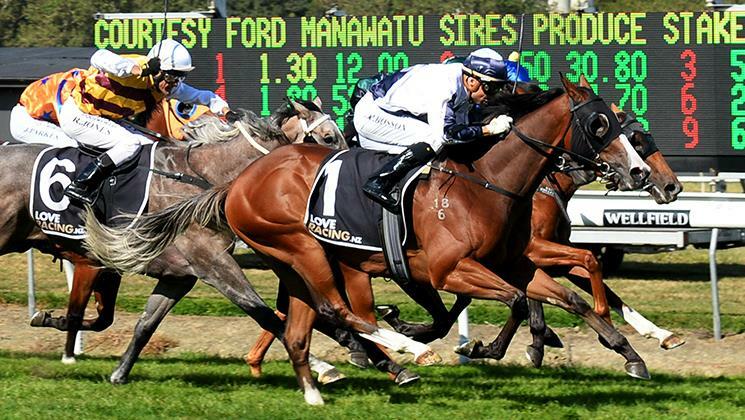 Flashy two-year-old Yourdeel put his name firmly in the reckoning for the title of New Zealand Champion Two-year-old of the Year when producing another outstanding performance to take out Saturday’s Group 1 Courtesy Ford $225,000 Manawatu Sires’ Produce Stakes at Awapuni. It was the Dundeel gelding’s fourth win from only six starts but, more importantly, he has now taken out the only two New Zealand Group 1 races for juveniles following a similar performance in the Sistema Stakes (1200m) at Ellerslie on March 9. 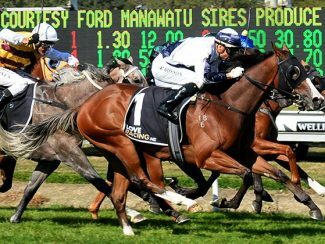 The battle for this season’s two-year-old supremacy has now come down to a two horse race with the filly Probabeel also rated highly after recording a hat-trick of wins including the Listed Karaka Million (1200m) at Ellerslie in January. She is now being campaigned in Sydney where she finished sixth, on an unsuitable heavy track, in the Group 3 Magic Night Stakes (1200m) at Rosehill on March 16 and will now contest this Saturday’s Group 1 $1million Inglis Sires’ Produce Stakes (1400m) at Randwick. Yourdeel started a hot favourite for Saturday’s 1400m Awapuni feature and looked a forlorn hope when well back on the home turn and spotting the pacemaker First Rock a conservative eight lengths. First Rock was still in front with 150m to run but the challengers were coming out wide with Yourdeel and Aretha leading the charge. Rider Opie Bosson had Yourdeel in full flight at the 50m as he blazed past his rivals to score by just on a half-length with Aretha snatching second from a gallant Bella Mente who clung to third from Aalaalune. Richards was still catching his breath as he reflected on the winning run, admitting he was actually watching stablemate Equinox who was contesting the lead for most of the home straight before weakening in the final stages. “I was actually watching Equinox halfway down,” he said. “He (Yourdeel) has really stood up and raised the bar this season hasn’t he, he’s quite an incredible horse. Richards also reflected on the path Yourdeel had taken over his campaign which started with a victory at Te Rapa back in December. “He’s taken a fair bit of making,” Richards said. “He was very colty in the spring then got laid back and started to overdo it. Bosson also admitted he had some dark thoughts during the running of the race when he found himself near the rear of the field with just 600m to run.